Drama is closer to life than movies, simply because there are no retakes. And that is why, whenever I watch a play, I'm filled with admiration for the skills and passion of the entire team involved. While there are some who do come in the limelight, it is only the tip of the iceberg that is visible. Most of the team remains hidden, behind the stage, merging seamlessly in the background. But the play is the result of a symbiotic relation between these various players whose only motivation is to make the play a success, to charm the audience enough to earn a spontaneous applause on that emotional scene or that part of passionate speech. There's no better way to picturize the success a team that works well together can achieve. Therefore, when my friend invited me to watch a play at the National School of Drama, I readily accepted. This was only the second play I was watching at the NSD and I was looking forward to it because the first play "बेगम का तकिया" had touched my heart and I had spent days after watching it imagining the amount of hard work the team must've put into it. The play that we were going to watch was titled "हमारा शहर उस बरस" which was about the trubulences a city and its people go through during communal unrest. At the centre of the turmoil is a family consisting of Daddu and his son Sharad and their tenants of many years, Hanif and Shruti (a couple). The play sensitively captures the escalating unrest in the background and its reflection upon the dynamics in the central household. Minorities are more or less portrayed as the victim at the centre while the majority is divided into three groups, defenders, attackers, and the silent. Conflicting voices of these sections of the society come across loud and clear through the course of the play. Guilt and pride about their religious roots dictates their actions and gradually, the situation disintegrates enough to let the outer unrest penetrate the erstwhile jovial and peaceful relationships in the household. 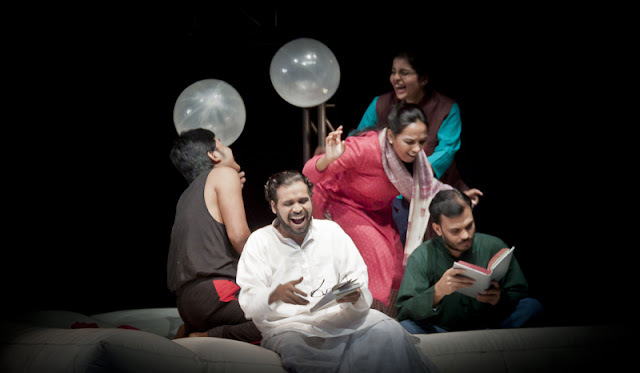 During the course of the play, the audience finds itself foreseeing the worse but the play stays clear of gore and morbidity, concentrating mainly on the crisis faced by humanity and seggregations that threaten to destroy a civilized society as well as a strong, tightly-bound household. The precise direction by Kirti Jain carries this complicated play with multiple character interactions in almost all scenes with ease. I could recognize many actors as they had also acted in "बेगम का तकिया". It was difficult to choose the 'best' actor as it was clear that all actors gave their life and soul to the parts they had been asked to to play. And it was difficult to find any faults. But yet, there were some who stood out. For example, the narrator Ipshita Chakraborty had an impeccable pronounciation and clarity of expressions. And the actor Jagannath Seth, who played Daddu, had perfect timing for comedy as well as outrage. I already have a lot of respect for the actress Sajida, who played Shruti, Rakhi Kumari, who played the student and the kaamwaali bai, and Punj Prakash, who played Sharad as I have seen their work in "बेगम का तकिया" as well. They never fail to deliver. I was surprised to know how simple a life these talented actors lead. They are far from the glamour enjoyed by the bollywood actors. Some people may argue but I feel that even the actors who play the smallest parts in these plays are more talented than some of the top actors in bollywood. These stage actors do not have high monetary benefits to look forward to after conclusion of each play. It's only their passion and a stubborn belief in their dreams that keeps them motivated. And I admire them for this fire. It's very inspiring indeed. If you like watching plays, I would surely recommend "हमारा शहर उस बरस" to you. Go and watch the play with an open mind. The subject can be a little difficult to deal but the team has done justice to it. Watch this play for the acting and the screenplay if not for the subject.